Some fitness circles argue that we need huge amount of variation to see improvement. You may have heard terms like "muscle confusion" to describe this idea is that we need to expose the body to a wide variety of exercises and workouts so that it never gets used to the incoming stimulus. But this isn't quite right. How much variation do we need in training? How much is enough? How much is too much? Like most things, the variety our bodies thrive on depend on our individual goals, our starting point, and our rate of adaptation. But we can make some generalisations about whether or not it's possible for your body to get "bored" with your workouts. So let's get into it! There's no such thing as muscle confusion. That's right. Muscle Confusion Is A Myth. First off, let's clear this up. As my co-coach Alastair says, "muscles can't get confused. They don't think. They don't have brains." In reality (here's the simple version), we apply a stimulus to the body by performing a certain exercise. If we used an appropriate amount of weight and did enough reps, it will provoke an adaption from our body. As we get more advanced and get closer to our genetic limits for fitness, the margin of error and rate of progress shrinks. It becomes harder and harder to make additional progress. The upshot is that total beginners can do almost anything and see an improvement. But, for intermediates and advanced trainees, repeated bouts of training are needed to create an adaptation. Just a couple workouts may not have much of an impact at this stage. What we do know is that the more advanced an athlete becomes, the more useful it is repeat similar workouts so that adaptation has time to solidify and become more permanent. This point is shown conclusively in Jan Olbrecht's book "The Science of Winning". You probably haven't heard of him, but he is one of (if not the) most successful swim coaches ever. At the Rio Olympics, he coached three of the top 5 swimmers in the men's 100m free, including gold and silver, as well as dozens of other swimmers at the games. To be clear, I'm not saying that variation is bad. Absolutely not. We just need a balance. Eventually, all training programs gets stale. To see more and more progress, you must change the training. How often changes need to occur depends heavily on the individual (some are fast adapting and need more changes, others adapt slower and need more consistency). What types of changes you'll make (new exercise variations, changes in tempo, different sets and reps, the number of training days per week, etc.) depends mainly on the goal and the individual's weaknesses. Too much variation isn't great for beginners. 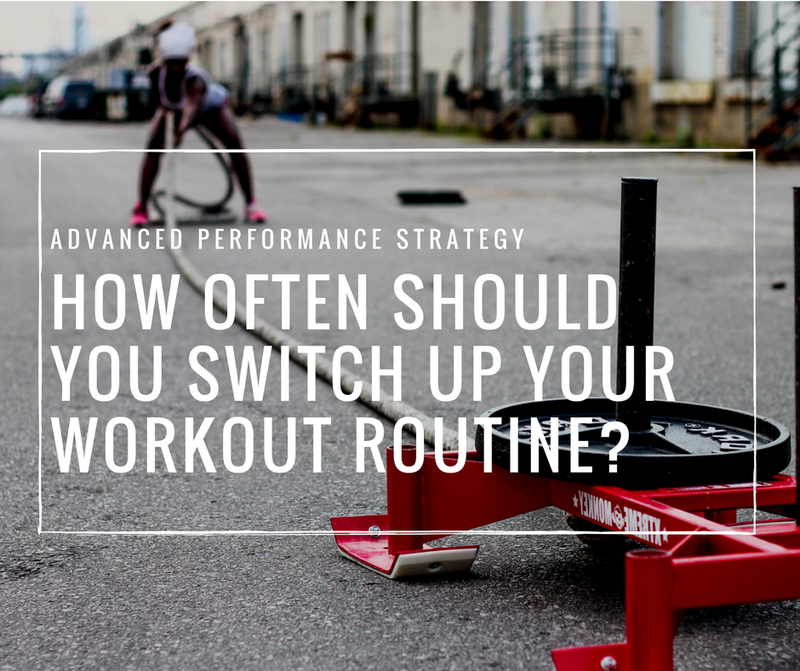 It's not just advanced athletes who benefit from repeating the same exercises and workouts. Beginners do too, but perhaps for different reasons. Beginners need lots of reps on a small number of basic exercises. When we first learn to squat, our brain is going in a million directions. You've got to think about grounding your feet, keeping tension in the glutes, bracing the core effectively, breathing in a certain way, breaking at the hips and knees in the right sequence, engaging the upper back, where to look, etc. That takes months of practice to start feeling automatic. Most the your strength gains in this phase comes from learning how to coordinate the movement better and by training your nervous system to activate more muscle fibers during the exercise. All of this requires lots of repeated efforts of the same movements in similar rep ranges. How often you should change your workout routine depends on your goal. When you consider how much variation to add into your training, think about your goal(s). If your goal is performance oriented, then the specifiic objective will dictate how much variation will be appropriate. The more specialized the goal, the more specialized the training. To some, the training might seem monotonous or boring, but it's necessary. On the other hand, if your main goal is to stay in shape and have fun, then you can add as much variation as your like to keep you interested! KEY POINTS: is variation really the spice of our fitness lives? To some, the fitness program that I follow may seem boring. Each week of a 4-8 week training phase is very similar. But it works. Variation isn't good or bad, it's just a tool. Despite what some say, more isn't always better. You want to find the right balance that will work for you.